You know the problem with slow cookers? They’re slow. While that may be a benefit to the actual cooking process, it does nothing for the eating process. (Well, until all that patience pays off, that is.) By the time dinner is done, it is completely likely that your appetite has shifted and you are in the mood to eat something totally different. But with a slow cooker filled with delicious stew or soup right in front of you, it’s hard to resist—even though it’s not exactly what you wanted. The Maxi-Matic EWMST-33 Elite Gourmet Triple Slow Cooker Buffet solves this dilemma by providing three separate cooking vessels. 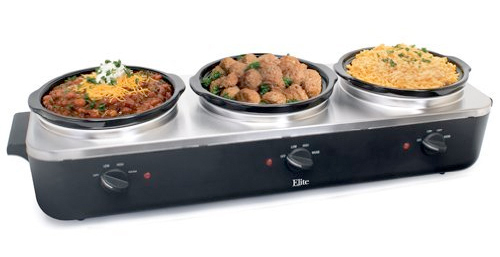 Each 2.5-quart ceramic pot comes with its own cooking control, allowing for three distinct meals to be made at a time. No matter if you are in the mood for pot roast, chili or beef stew now, chances are you’ll be hungry for (at least) one of them by the time the cooking is through. As an added bonus, the slow cooker could probably be used as a serving buffet for parties or something if you really needed it to.